We’ve known for quite some time that Tesla has been working on a big rig truck. It’s a very logical progression from their core automotive business, and an excellent space to develop autonomy and possibly even battery-swapping technology. We’ve had no idea what the thing might look like so far, leading to speculative Photoshoppery like what I did up there. Now we’ve got our first hint. Let’s take a closer look at the image and see what we can determine. Zoom and enhance! • There will be very stylized headlights, with hockey-stick-shaped LED DRLs. 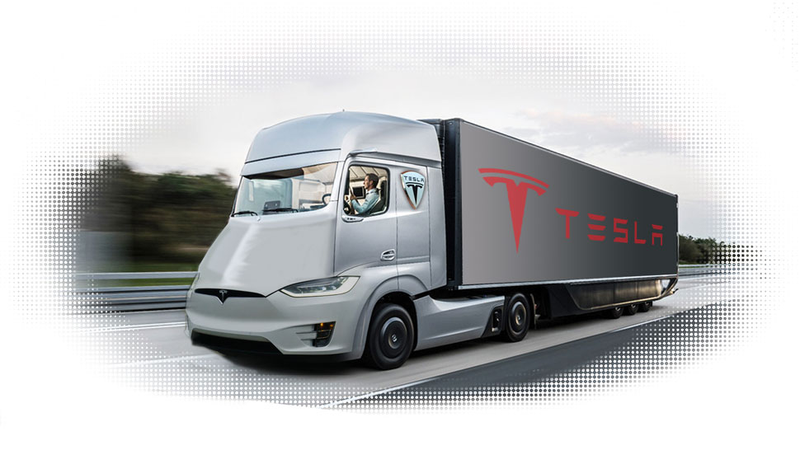 • There cab seems to be the full height of the trailer; unlike conventional trucks with cabs that are about the height of the windshield, the Tesla truck seems like it’ll form a single, monolithic shape. • There’s no mirrors shown. Camera system, or just artistic license? I think we’ll see a ‘face’ that sort of resembles a Model S, and the side profile of the cab will blend fairly closely to the trailer, which should give a lot of aero benefits. I bet these things will need mirrors and other hardware to exist in reality instead of the impossibly clean version we see here. Musk also described the truck as being “spry” and said it can be driven like a sports car, which, even if true, probably isn’t crucial to the success of a big rig. The truck is expected to be revealed in full in September. I wonder how close my crappy sketch will be. Breaker breaker, what's your 20, good buddy?